Please click here to return to the paper on China. This is about Comment 7 and China. The Boston Consulting Group issued a report on the cost of manufacturing production in China. Noting wage and other inflation, skill shortages and the underlying trends such as demographics, BCG suggested that 10 to 30 percent of outsourced manufacture would become equally cheap to manufacture in the US. Their conclusion - that this would "add" huge sums to the US economy, or that it would repatriate jobs - is plainly ridiculous. There will be many cheap hands elsewhere - India, Indonesia - if China ceases to fulfil the need. If there were not, it would imply costs pressures on the US economy, hardly a means to "add" to output. However, what this does ask us to consider is what effect it would have on China. 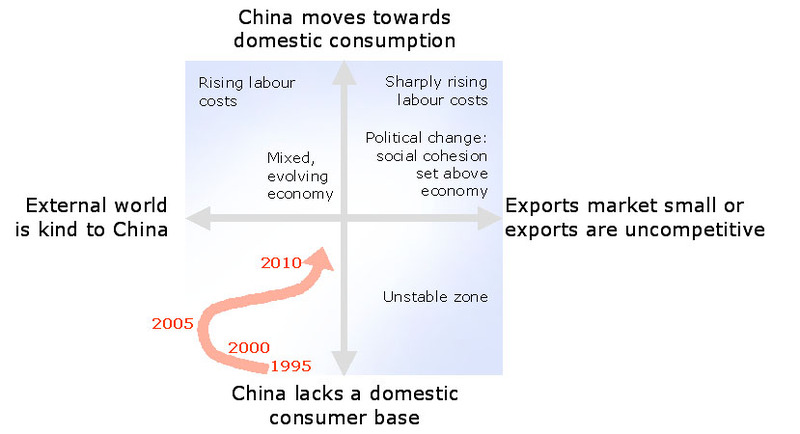 What follows suggest that China is about to experience a wave of labour power, which will add to its costs, slow its productivity and its growth. You discussed this in the intro paper, but here is strong confirmation. The China Labour Bulletin is a non-governmental organisation that was founded in Hong Kong in 1994. It sets out to promote labour rights in mainland China. It estimates that there are around 30,000 strikes and other protests every year, on a sharply rising trend. The number of protests recorded in July of 2012 increased by more than 40 percent over the previous month. Particularly younger workers, aided by modern communications, are confident of their ability to organise labour, and embryonic collective bargaining is coming slowly into existence. This is in strong contrast to the recent past. When Jaing Zemin and Zhu Rongji began the radical reform of the state operated enterprises in the mid 1990s, around 30 million people abruptly lost their jobs, thrown from the "iron rice bowl" that had previously guaranteed their security. Prior to 2003, there was no legal structure to guide what local officials and business people could do. Privately-employed workers grew to 60 million in 2010. This was supplemented by about a quarter of a billion migrant workers, people working illegally whose rights could be abused with impunity. Nevertheless, skill and labour shortages were appearing on the coast as early as 2004, hidden by the world slow-down and now once again prominent. Fifteen provinces and municipalities have increased their minimum wage this year. Shenzhen, where some of China's largest electronics manufacturers are located, looks set to have its minimum wage hiked by 13.3 percent from 2013. Average wages have, however, risen much faster, demonstrating the skills shortage that China is experiencing. The government is, of course, attempting to switch to a consumer-driven economy, rather than rely on export led growth. It has a range of policies aimed to achieve this, but introduced an agreement by which 60% of major enterprises would have collective bargaining systems by 2010 and 80% by 2012, with small companies linked to regional schemes. A variety of other laws - occupational health and safety, contracts, dispute mediation and social insurance were dropped into place. The 2008 dispute settlement law doubled arbitration cases in a year. All of this was, however, loosely implemented and provincial officials often worked closely with local business interests. China has, traditionally, appealed to the central power in the case of injustice. Tens of thousands of such petitions flow in to the Party's central commission monthly. Protest movements have increased sharply, to an official figure of 80,000 for 2007, the last year for which there are figures. Informed guesses place the 2009 figure at around 100,000. To be recorded, such protests have to require at least potentially forceful management. The state has increased spending on such machinery of control by 11.5% in 2012. It places great emphasis on non-confrontational management wherever possible. Most protests in the early years of this century were concentrated in state owned enterprises, which had essentially completed their transition by 2006. Now protest is focused on private sector companies. Almost all recorded protests are urban and associated with manufacturing, and what happens in the rural hinterland is unknown. It appears that teachers - and particularly the "barefoot" teachers of the villages - are leaders in activism. Another transition is the nature of protest. In the early years, it was entirely reactive, seeking to protect prior rights. Many protests were concerned with pay arrears, in that managers tended to pay people when they had the money, rather than regularly. Now, these issues are still very important, but have been supplemented with demands for better pay and conditions. The government made the irregular payment of wages a criminal offence in 2011, but arrears remain rampant and a tiny number of prosecutions. In 2012, the media several cases in Guangdong and Shandong where factory owners had gone overseas on holiday for several months without paying workers' salaries . In 2010, a wave of such strikes affected automobile production, oil workers and other large scale activities. Protests are usually peaceful, often blocking roads and urban centres, but around 15% involve damage to factory equipment and other violent disturbance. In over five hundred case studies, not one involved or was resolved by the official blanket trades union, the state-organised All-China Federation of Trade Unions that dates back to 1925. The nature of the workforce is changing sharply. Take the lowest on the tree, the migrant workers who are lucky to obtain the minimum wage. Just under a third have high school or better education, and half have access to the Internet. Virtually all were not agricultural workers before they came to the city. Perhaps as a result, half intend to stay. A generation has shed its roots, its governing ethos and, probably, its restraint. The state has lifted some control on what the media may report on labour disturbances, and television and radio discussions of these issues have become relatively common and uninhibited. By contrast, there was no such reporting whatsoever in 2000. Half a billion Chinese use the Internet, and informal sites are their chief source of news. The tradition of the "petition" against anti-social behaviour by managers and bosses fits well into this environment, and stories propagate rapidly and create a corpus of examples and ways fo thinking about these issues. Down at the bottom left, China's last twelve years. Where they want to go is straight up, which implies rising labour costs and a lot more welfare because they want people to spend and not save for old age. But how to manage a slow transition, when people suddenly see in a different way, when unions get power and so on? There are many forces that will push up costs and also push the society to the right of the figure politically. So what you get is a rush to the right of the figure. That has lots of feed back in it with social awareness and populism opens up a whole new world. It like took China 20 years to follow Western development and its going to take maybe 5 years to follow welfare dependence and maybe decadence. OK too strong word but easy to see how ambitions get too big and politicians have to follow? Look, though, at the unstable place below that. What happens if the consumer base cannot be made quick enough? That is, people don't trust the state and they go on saving, the provincial powers go on siding with local business, unions do not get a grip? Well, if the rest of the world had stayed the same, that would be more of same for China. But the world economy is depressed and a whole lot of new competitors are coming up in the emerging markets, to the wind also blows to the right of the figure, but now at kind of knee weight. So there are like two paths for China to get into the lower right, the Unstable Zone.